Bulk Account Payments – How can we help? If you are a retailer who processes a high volume of either on account or lay-by sales, paying off each sale individually can be a lengthy process. If this sounds like you, then you can use Vend's new bulk account payment feature to pay off multiple individual sales against a single customer. 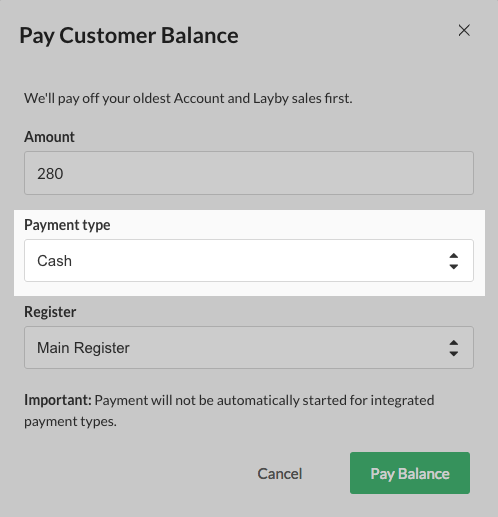 With this new feature, you can now pay off a customer's balance in bulk directly from the customer screen without the need to go through each on account and layby sale individually. 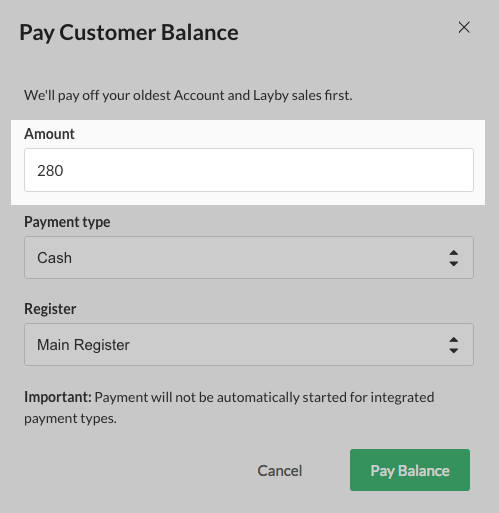 Important: If you are paying off multiple account sales with an integrated payment method, the amount will not automatically trigger your payment terminal. Because of this, you will have to make sure to also enter the amount manually into your integrated payment terminal. Important: If you have account sales that are linked to Xero and have made some partial payments to these on Xero's side, make sure to check for Xero payments in Vend before paying them off in bulk. 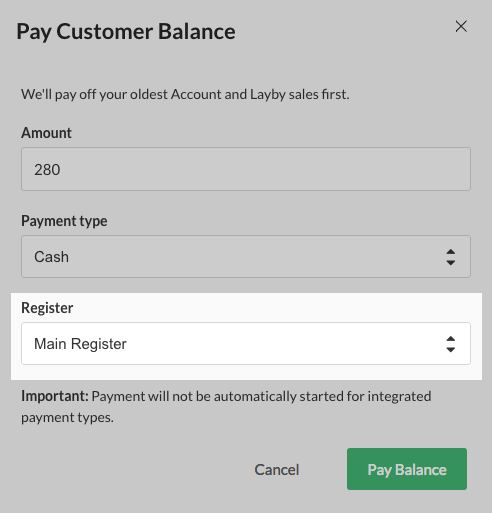 First off, navigate to the Customers page in Vend and select the customer whose balance you wish to pay off. Once you have selected the customer, you will see an option along the top to ‘Pay Balance’. Click this button and enter the total amount the customer is wanting to pay. Note: You can receive a payment equal to or less than the total amount owing but you cannot pay more than the total amount owing against the customer. After you have entered in the desired amount, select the payment type you wish to process the payment through. Important: This will not trigger integrated payment processing for integrated payment types. If you select an integrated payment type, you will also have to enter this amount manually into your payment terminal. Finally, select the Register that you wish to process the payment from. This payment will be reflected in your selected register's end of day closure so make sure you select the right one! The payment will now be applied (starting with the oldest invoices first) and the customer's total balance will be updated. After you refresh the page, you will see the new balance, adjusted accordingly. Note: If you are a Xero user it may take a few seconds to update all of the invoices and syncs them with Xero. Right now, this is the only way you can pay off account balances in bulk, but we will be adding an option to pay them off via the sell screen soon.